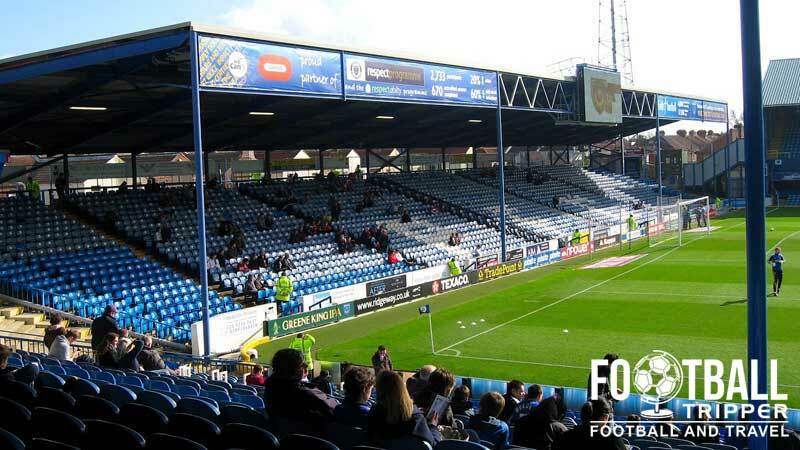 Fratton Park is the home ground of recent Premier League team Portsmouth F.C. 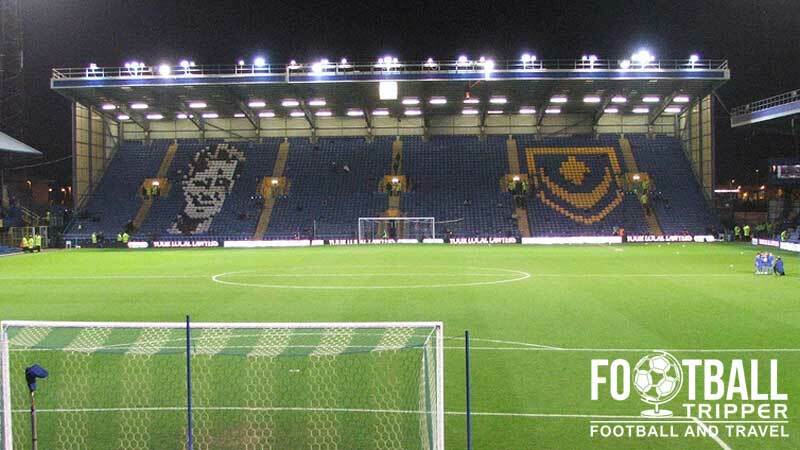 Home to Pompey since 1898, the stadium has a 21,100 capacity and is currently used to host matches of League Two. This is of course in great contrast to when the club held the likes of A.C Milan in 2008. 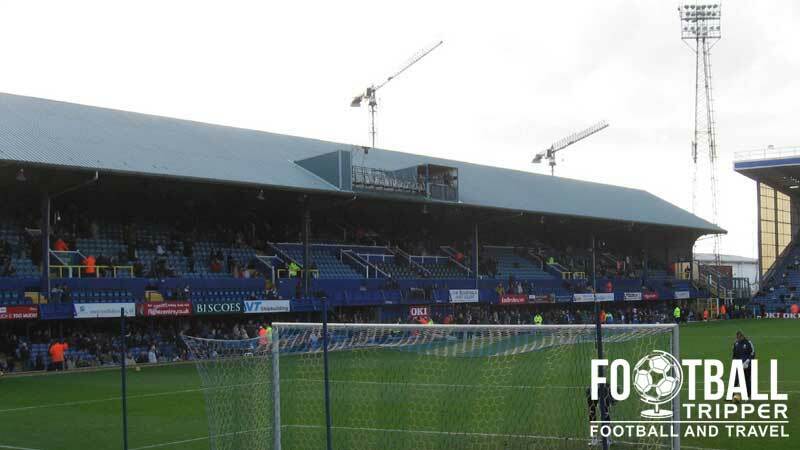 Fratton Park has been the home ground of Portsmouth Football Club since its formation back in April 1898 with famous footballing architect Archibald Leitch designing the original iteration of the Main Stand. At the time it was described as a “Ornante Pavilion complete with Clocktower” similar to that of Fulham’s Craven Cottage. The opening game at Fratton Park was held against Southampton with Pompey beating their local rivals 2-0 in a match which ignited the long term passion of the Portsmouth faithful. There’s an immense volume of history located within these four stands with Fratton Park hosting a football match in the 1948 Olympics (One of only two grounds outside of London to do so) , and an England International Match against Wales back in 1903. Despite this history many commentators believe the club should relocate to more modern facilities and after surviving their inaugural season in the Premier League in 2003/2004 there appeared to be the ideal platform for this to happen. Three out of the four proposals would have seen Pompey move to a new location including one from 2007 which would have seen the creation of a 36,000 capacity stadium on reclaimed land next to Portsmouth Naval Base. None of these plans have ever come to fruition and with the club continuing to battle on-going financial problems, and relegation to the lowest tier of the Football League, relocation in the immediate future doesn’t seem very likely – enjoy the historic grandeur of Fratton Park whilst it lasts. Fratton Park consists of four sections: The North Stand, The Milton End (East), The South Stand and Fratton End (West). Away supporters are housed behind the goal in the Milton End which is capable of accommodating an estimated 3,200 fans. The normal allocation is around 2,000 with the remaining seats shared with some home supporters who are usually separated by three rows of seats and a thin piece of netting. 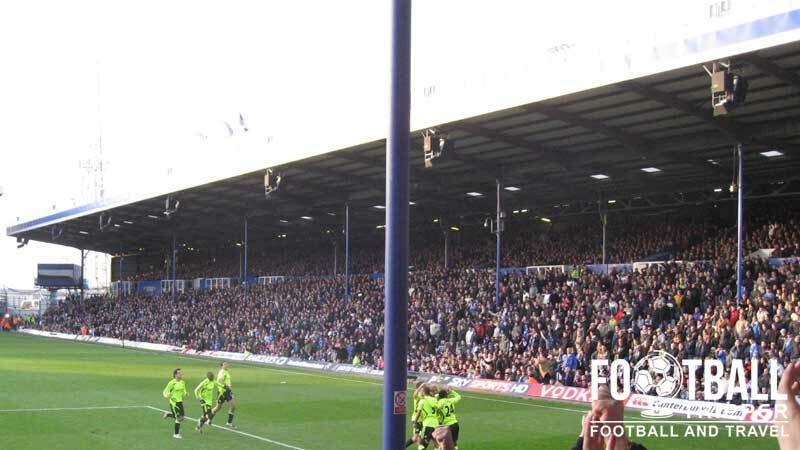 As Fratton Park is one of the more historic grounds in football today the facilities can feel comparatively dated, with some of the seats within the second tier of the Milton End facing partially obscured views due to the use of support pillars for the roof. Previously used as a terrace, the conversion to all-seating hasn’t resulted in the most comfy of seats, with leg-room just about ample to say the least – although it is irrelevant as the away fans often like to stand for the match and try and out-sing the lively home support. There are a dozen or so pubs scattered around Fratton Park meaning that the queues for a pint on match day are never really too long which is an added bonus unlike some stadiums which are over reliant on one or two joints for refreshment. Besides both the Brewer’s and Newcome Arms which some fans suggest are the typical boozers of the home support, most pubs in the area welcome away supporters with the roundabout next to Fratton Station offering you either the choice of Fratton or Fawcett Road. Both roads are home to well-established pubs with The Fawcett Inn and The appropriately named Red White & Blue towards the south, competing against the Froddington Arms and The John Jacques to the North. Towards the east of the ground away from the station The Good Companion next to Milton Cemetery is also a popular choice on match day if you want a slightly further out choice. The two staples of Fratton Park are probably the McDonald’s and KFC on Fratton Way to the west of the ground with a Tesco express and Co-op located towards the south-east on the A2030 Goldsmith Avenue. Near to the station, the two main roads listed above for pub recommendations also have plenty of independent food choices including Curry World, Kingdom Kebab and Golden Bowl Fish & Chips which some may prefer in the coastal surroundings. Portsmouth FC run a tight ship of a club shop at Fratton Park located on the corner of Goldsmith Avenue and Fratton Way, as well as their own official online site, The Pompey Store. The exterior of the Pompey Megastore. It doesn’t appear as if Portsmouth FC currently offer fans the chance to undertake a stadium tour of Fratton Park. If this changes, we’ll be sure to update this section. Tickets to see Pompey can be purchased via the usual channels including telephone ((023) 9277 8559), email ([email protected]), in person at Fratton Park ticket-office (Monday – Friday: 9.00 am – 5.00 pm) and on the internet by visiting Portsmouth Online Tickets. Please note that tickets for accompanied juniors can only be purchased at the stadium, and that prices for cup competitions differ. Pompey’s stadium takes its name from the area of Portsmouth it is located within – Fratton, and it is approximately 1.5 miles inland from the coast. The famous turnstile housed within a mock tudor facade,. This is located in the south-west corner and is the entrance to the Fratton End. Fratton Station is less than 0.7 miles away from Portsmouth’s stadium with the walk taking between 10-15 minutes depending on your speed. Once you have arrived at the railway station exit via the footbridge and turn left onto A2030 Goldsmith Avenue. Continue along here for approximately half a mile past the roundabout and turn left at Frogmore Road with the stadium situated at the bottom of the road. Frogmore Road, Southsea, Portsmouth, PO4 8RF. Pompey fans playing up to their colours. There is a car park at Fratton End which costs £5 and operates on a first come, first served basis. A small allocation is usually reserved for away fans but this isn’t always guaranteed. 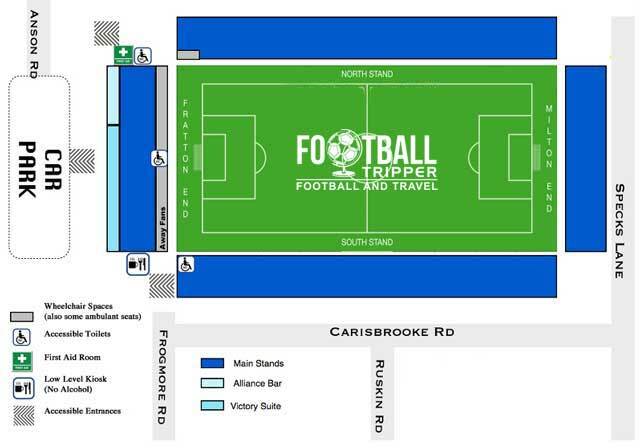 Please note that on matchdays it is also only accessible from Anson Road and not Fratton Way. The closest hotels within Fratton is definitely the Hotel Ibis which makes an effort to call itself “budget” although it’s hard to tell with most chain hotels. Back towards the start of the M275 there is a Travelodge strategically placed for a quick getaway and around Portsmouth’s historic dockyard there plenty of fancier options. Southsea is also worth looking at with most hotels guaranteeing a pleasant sea view.